I hope you had a wonderful weekend, as we get a start to our week I wanted to share a Medium post on DNC fundraising from our Finance Chair Henry Muñoz. In 2017, the Democratic National Committee raised $65.9 million. That’s more than in any off-cycle year since 2011, and more than we raised in 2005 and 2007, years that preceded the Democratic takeover of both chambers of Congress and the election of Barack Obama, respectively. And that total doesn’t even include the money raised by the DNC last year for its new Democratic Grassroots Victory Fund, which provides critical additional funds to help our state parties. How are we doing this? Not only are we seeing an increase in donor confidence, but we are witnessing record grassroots fundraising. Nearly two-thirds of our total contributions are $200 or less with an average online donation of $21. This is happening because people are excited to elect Democrats. Look no further than last year’s marquee races. In Virginia, donor enthusiasm allowed us to invest $1.5 million to elect Ralph Northam governor and put him in a strong position to actually govern by flipping 15 seats in the House of Delegates from red to blue — a feat the likes of which we haven’t seen the state since the late 19th Century. In Alabama, our Republican counterpart cut big checks at Donald Trump’s behest in a desperate attempt to bail out an alleged child molester. We took a different approach and rode a wave of grassroots enthusiasm powered by over 40,000 contributors. The result: nearly $ 1 million, including almost $700,000 directly to the Doug Jones campaign, that funded African American and millennial outreach, data, tech, research, and boots on the ground. Our debt is at its lowest point for an off-cycle year since 2009 and we have more cash on hand than we had in 2005 and 2007 — years that both preceded major Democratic wave elections. And two-thirds of our contribution revenue last year came from grassroots donors giving small-dollar contributions (less than $200). 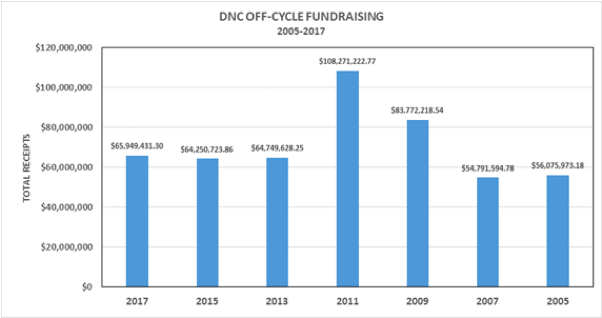 Still, a number of reports have been published this week ignoring these upward trends and highlighting the disparity in fundraising between the DNC and RNC as if it’s news. It isn’t. Let’s look at the last off-year that Democrats were completely out of power: 2005. The RNC outraised the DNC by $51 million. What happened in 2006? A Democratic takeover of both houses of Congress. Fast forward to 2007. The RNC outraised the DNC by over $30 million. The next year, Barack Obama was elected the 44th president of the United States of America and Democrats padded their majorities in both the House and Senate. Here’s the bottom line: The leader of the Republican Party is a billionaire fighting for billionaires. Until last week, their finance chair — my Republican counterpart — was casino mogul Steve Wynn, a man accused by multiple employees of a decades-long pattern of sexual misconduct. And the GOP’s one real legislative achievement last year was slashing taxes for the wealthy in a system rigged to favor the 1%. So there’s nothing surprising about their ability to attract big donations from the likes of the Koch brothers to pad their war chest — money is #1 on their list of values and it shows. But all the same, Democrats are winning on the most important scoreboard in politics — we’re winning elections. Since Trump took office, we’ve won over 100 local and state elections and flipped 34 state legislative seats from red to blue. We’ve picked up seats in deep red districts in Georgia, Oklahoma, and Iowa. And we’ve won critical races in Virginia, New Jersey, and Alabama, where Doug Jones just became the state’s first Democratic senator to be elected in 25 years. We’re winning because Democrats are fighting for working families, for people struggling to make it into the middle class, and for people who didn’t inherit their wealth. And we’re winning because we’re investing in organizing in every ZIP code, building up our state parties, and getting people registered to vote. This is just the beginning. On Tuesday, November 6th, votes will be counted across the country in an election that could be historic for the Democratic Party. Enthusiasm for our candidates is growing every day, and we’re making unprecedented investments to ensure that we’ll cross the finish line victorious on Election Day. But we need all the help we can get. Every single dollar in every small donation helps to strengthen our party and elect Democrats up and down the ballot. Either Democrats will take control or Trump will continue pushing his divisive policies. The time to take action is now.